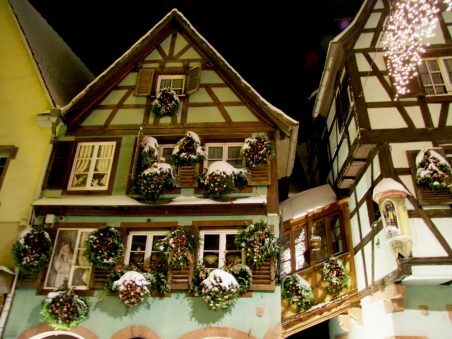 Located between Strasbourg and Colmar, the historic town of Sélestat is an important landmark in the history of Christmas traditions. 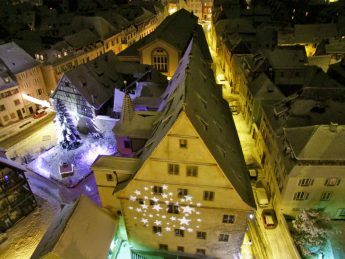 The Sélestat Christmas Market occupies the old town selling Christmas decorations and ornaments, local produce and handicrafts from Alsace. 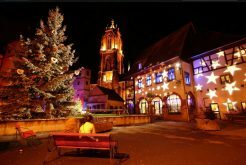 It was in Sélestat that the first Alsatian Christmas tree appeared. Or, at least, it is in the town that, on the 21st December 1521, a decorated Christmas tree was mentioned for the first time in history. 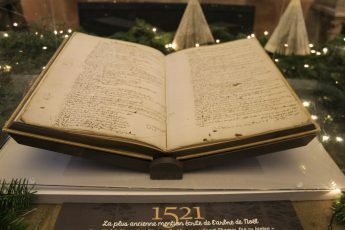 Stored in the Humanist Library (Bibliothèque Humaniste) and dating to 21 December 1521, the records of the city of Sélestat make mention of the tree on page 239, in reference to four schillings which were given to the forest rangers to watch over the tree on Christmas Day. 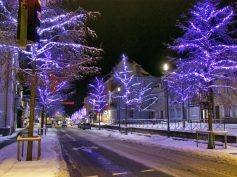 The city of Sélestat had to spend this money in order to protect its woods from being ruined by the locals who wished to decorate their Christmas tree. More than decorating just a branch, the inhabitants of Sélestat adorned the whole tree – which was hung from the ceiling -, thus starting a new custom that would continue throughout the centuries to come across the whole world, from New York’s Rockefeller Centre to St Martin Place in Sydney. The book of records from 1521 is on display at the Humanist Library. The Sélestat Christmas Market (Marché de Noël de Sélestat) welcomes the visitors in Place d’Armes in the heart of the historic town. 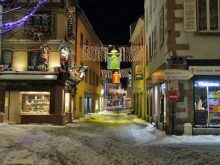 Visitors will find Christmas decorations, “vin chaud” (mulled wine), Christmas cakes, biscuits and gingerbread without forgetting local Alsatian produce. 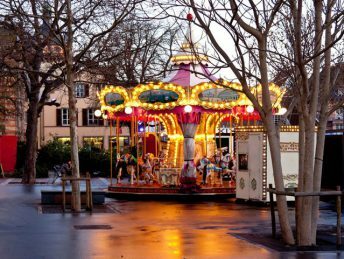 The Sélestat Christmas market is open from 1 December to 24 December 2017. The place du marché vert welcomes an ice-skating rink and a Christmas chalet selling Alsatian produce. From 6 December 2017 to 7 January 2018. A giant video projection is played onto the façade of the St. Georges church. It is designed on the theme of the Christmas tree. From 1st to 23 December 2017, every day from 4.30pm to 7pm. The screening takes place every 10 minutes. 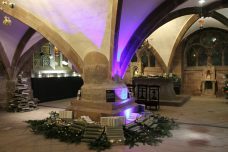 A Christmas Tree Exhibition organised inside the St. Georges Church reveals the most noticeable historic stages in the development of the decoration of the Christmas tree from the 16th century up to today. The exhibition also shows how the evergreen trees were decorated over the past centuries. It explains how it left a trace of the past in the region of Alsace. 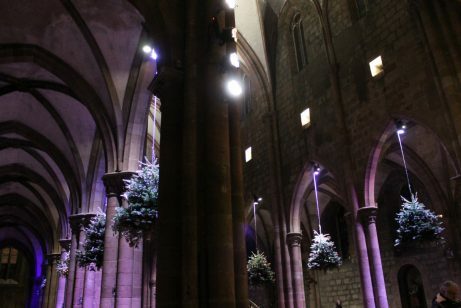 Decorated fir-trees are hung in the nave of the church under the arches as they were originally. The fac-similé of the book of records from 1521 which reports the first mention of a decorated fir-tree for Christmas is on display in the crypt of St Georges church. From 25 November 2017 to 7 January 2018, everyday from 9am to 7pm (except during religious services). Enter in St. Foy Church to admire the beautiful Meisenthal baubles chandelier. It comprises 173 Christmas baubles in various colours. From 25 November 2017 to 7 January 2018, everyday from 9am to 7pm (except during religious services). 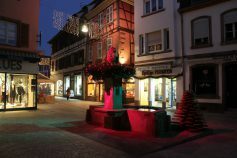 On your visit to Sélestat, participate in one of the many Christmas events organised by the municipality such as the Jardin du Sapin (Evergreen Garden), at 7 Place du Marché aux Choux, where a small wood of evergreen trees has been reconstituted and is marvelously illuminated from the nightfall. From 25 November 2017 to 7 January 2018, every day from 9am to 7pm. Like many towns in Alsace, the streets of the historic centre of Sélestat are richly decorated and lit up for Christmas. Some of the beautiful old façades show a fantastic display of Christmas decoration. 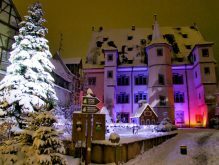 During the period of Advent, it is best to discover Sélestat at night fall. 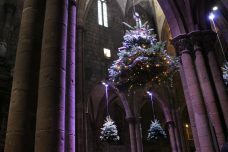 Then the illuminations adorn the town’s monuments and landmarks such as the Gothic St. Georges Church and the Romanesque St. Foy Church, the Town-Hall and the medieval gate locally known as Porte Neuve. The competition for the best creative Christmas trees. The nominees are exhibited on the 2nd floor of the Sainte-Barbe centre from 29 Nov. to 28 Dec. 2017. More info. Midnight mass at St. Georges church. 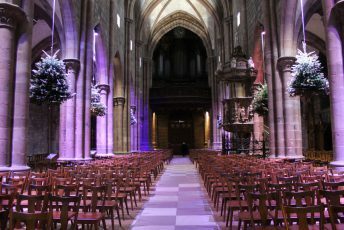 The event Noël a cappella shows a contemporary look and design to Christmas through two exhibitions: “Objets de Noël, Noël en objet” and “les boules de Noël de Meisenthal font joujou“. From 25 Nov. to 23 Dec. 2017 at the St. Quirin chapel, rue de l’Hôpital. More info. and more… find out more here. The town of Sélestat is situated in the centre of Alsace, between Strasbourg and Colmar. With a population of 20,000, Sélestat display a rich architectural heritage which includes several mansions and town-houses such as the Ebersmunster House (1543), the Ziegler House (1538). The picturesque Tanner’s district contains half-timbered houses dating from the 15th and 16th centuries. Sélestat houses two magnificent churches: the Romanesque église Sainte Foy and its three bell towers (12th C) and the Gothic église Saint Georges (13th-15th C). The Humanist Library of Sélestat is Alsace’s oldest public library (1452). It contains 450 manuscripts, 550 incunabula and 2,000 printing works from the 16th century. French Moments would like to thank Philippe Clabots, Thomas Kempf, Selestadium Novum, Sélestat Haut-Kœnigsbourg Tourisme, and Ville de Sélestat for giving us the opportunity to share their photos on this page.